You know the importance of taking care of your teeth by brushing and flossing regularly and visiting your dentist in Tyrone, GA, regularly. However, with all the other things that occupy your time every day, it’s easy to forget about another important aspect of dental care in Tyrone, GA: changing your toothbrush. Knowing when to replace your toothbrush isn’t as simple as paying attention to when it wears out, so here are some things to think about when deciding if it’s time to replace it or not. Most dental practices offer a complimentary toothbrush every time to visit their office, which for most people is every 6 months. This may be the only time you think about changing your toothbrush and in fact, you may not even think your old toothbrush is worn out enough to warrant a change. However, how worn down your toothbrush is isn’t the only reason you should change your toothbrush periodically. Tens of millions of germs live on your toothbrush and there could even be microorganisms growing there as well. Although most of these microorganisms and bacteria are harmless to your teeth and mouth, replacing it at appropriate times can give you a fresh start which is good for your peace of mind. Another good reason to change your toothbrush is that they do wear out and although it may feel like your teeth are clean with a worn-out toothbrush, they could be cleaner with a new one. When the bristles get frayed, it’s difficult for them to clean teeth as well. Now that you know why your toothbrush should be replaced, you need to decide when to replace it. Although changing it every time you see the dentist is a good start, your toothbrush should actually be changed more often than that. Most dentists recommend changing your toothbrush every 3-4 months. You can examine it to see how frayed the bristles are. Many children need their toothbrushes replaced more often because they brush harder than most adults. An easy way to remember to change your toothbrush is to put a reminder on a calendar or electronic device for the time exactly in between your twice-yearly cleanings. 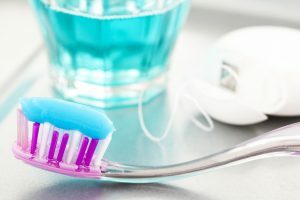 In the meantime, there are things you can do to maintain your toothbrush to not only help it last longer, but to minimize the number of bacteria and microorganisms as well. 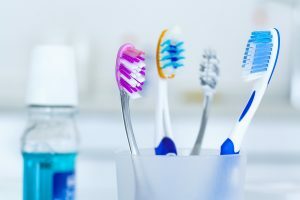 The toothbrush should always be rinsed with tap water after brushing, but it should also be stored vertically so that it’s easier for the bristles to dry. The bacterial and microorganisms can’t survive without moisture, so a dry toothbrush is cleaner. You can also preserve your toothbrush (and your gums) by brushing with a lighter hand. Remember to brush in a gentle, circular motion rather than a rough back and forth motion.